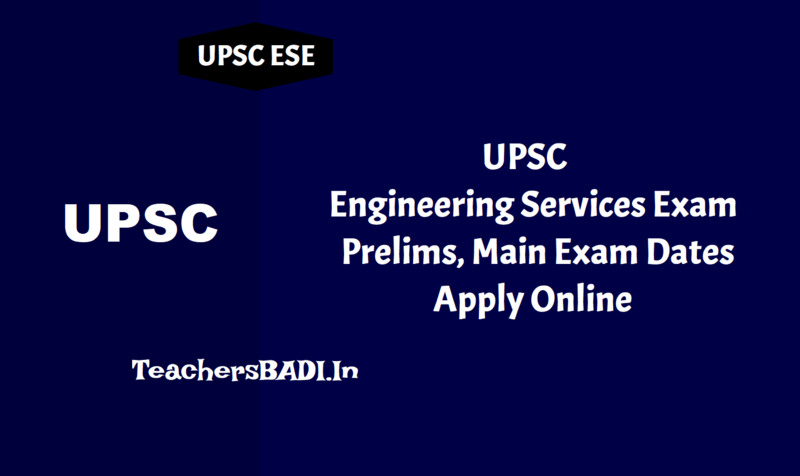 UPSC Engineering Services Exam 2019 Notification released, Prelims on January 6: The Union Public Service Commission (UPSC) has issued a notification announcing examination dates and procedure for filling up applications for engineering positions in various departments of the central government. The notification for the 2019 Engineering Services Examination has been posted on the commission’s official website. Aspirants are required to check eligibility conditions and instructions before applying for the exam, exclusively through the website www.upsconline.nic.in. 4. Electronics & Telecommunication Engineering categories would be filled through the examination. Age Limit: 21 to 30 years on the 01st August, 2018. Qualification: Degree/ Diploma in Engineering. Plan of Examination: Engineering Services (Preliminary/ Stage-I) Examination (Objective Type Papers), Engineering Services (Main/ Stage-II) Examination, Personality Test. The preliminary examination will be held tentatively on January 6, 2019 at various centres across the country. There will be negative marking for wrong answers by a candidate in the objective type question papers. Candidates will be required to choose their preferred examination centre while applying. The commission will allot the centre on first-apply-first-allot basis. Candidates shall be issued an e-admission certificate three weeks before the commencement of the examination and will be available on the official website.